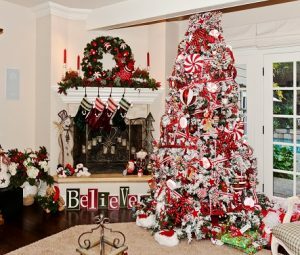 Please join us this year on our fabulous Holiday Home Tour where we showcase beautiful festively decorated homes in the San Ramon Valley. Your ticket of $35 will provide scholarships for women in our communities to advance their higher education and also send 10 middle school girls in the San Ramon Valley area to a one-week Tech Trek math-science camp for girls in a 4-year university setting. For more than ten years, our Danville-Alamo-Walnut Creek branch of AAUW (American Association of University Women) members have put together this Holiday Home Tour to advance education and equity for women and girls. Our Holiday Home Tour raises funds for our Tech Trek program and Local Scholarships. From the funds collected in our past Holiday Home Tour, we disbursed four-$2,000-2,500 local scholarships for college level women, and 10-$1,000 Tech Trek camperships for middle school girls. At our membership brunch in September, seven eighth grade girls who attended the week-long Tech Trek camp this summer at Sonoma State University, spoke about what a life changing experience it was for them. It’s such a great program that our national organization is taking it to other states. We will be having ~150 volunteers working on this event. During the two Tour days, we will staff about 4-6 volunteers each for the 4 shifts at each of the 5 houses as docents (Fri and Sat, morning and afternoon). DAW-AAUW members: please click here and volunteer your time and home-made dessert refreshments. Creative Endeavors Scholarship: The funds raised from the drawing for the beautiful handmade quilt, is used to awarded a scholarship to a young woman pursing a career in the creative or visual arts. Please purchase your quilt drawing tickets at our DAW-AAUW October and November events, or during our Tour days on Decembers 8th and 9th. With your interest and participation, we are looking forward to an exciting tour this December.